Adam and I decided to go up to Brisbane to surprise our matron of honour for her 60th birthday which is going to be celebrated on January 3. 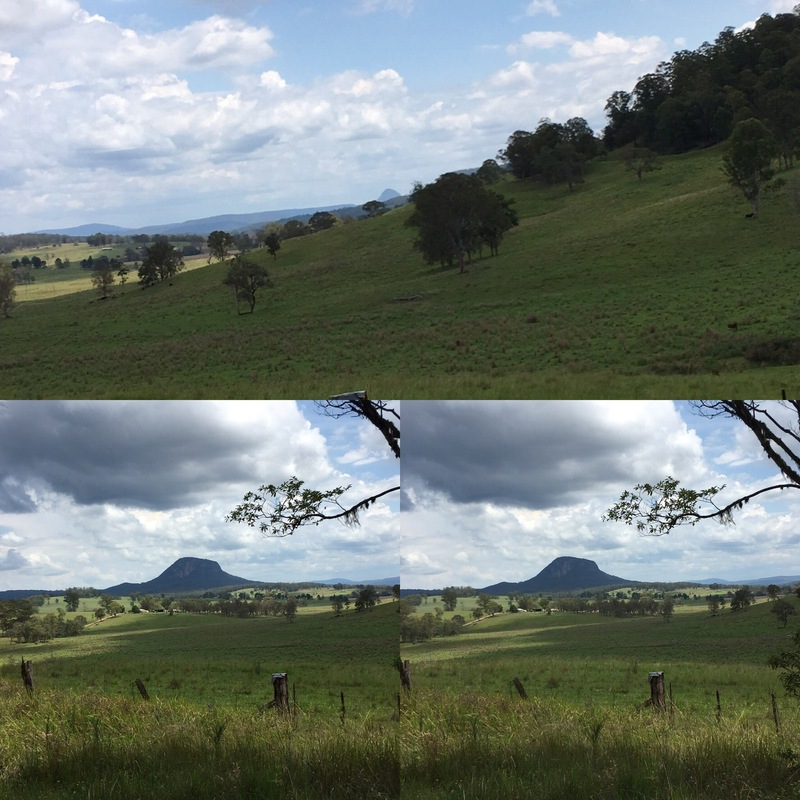 We drove up the day before and instead of taking the Pacific Hwy we went the inland way which took us through Casino, Kyogle and into the scenic drive area of Queensland. It was only an additional 10 minutes to our trip. We stopped in Grafton to buy another name tag for Mitch and it was then that we decided to go the inland way instead of the usual route on the Pacific Highway. It was interesting how the trip turned out. It was a hot, sunny day. It was nice having our dogs in the back of the Jeep. We tied Mitch down because he has become arthritic and tries to jump out before we have the back door open. Adam noted I seemed much more light hearted with the two dogs as travel companions. They always love looking out the windows and Grady snuffles at the window trying to smell the new areas we travel through. It reminds me of my mom telling stories about Judy wanting them to roll down the window on long road trips they would do as we travelled places. I notice all the strange little signs and read them aloud so Adam can also hear what I am seeing. There was a Pringles Way which made me think of my brother Kevin’s partner, Lisa because she loves Pringles as well as a Grady creek(our youngest dog is Grady). The name of Summerland Way changed to Mt Lindsay Way when we reached Queensland making me think of my friend Lindsey whom I met through World of Warcraft. My dad always asked us girls to read the signs for him as we would drive to different places because he was blind in his left eye from a childhood accident which I always say prepared me to be Adam’s wife in a round about way. He doesn’t mind me reading out all the things I see because he is blind since birth. My first husband didn’t appreciate me rattling off the signs like I always do. It is funny how things just seem to work out. On the way home, I am sure we will go back the Pacific Highway because it will be way less winding. There will be lots of construction but that is to be expected. Adam and I have had discussions about US roads and Australia roads. I still find it remarkable that Australia hasn’t a big interstate system like the United States but then again, Australia is still a young country and doesn’t have the population that the US has. 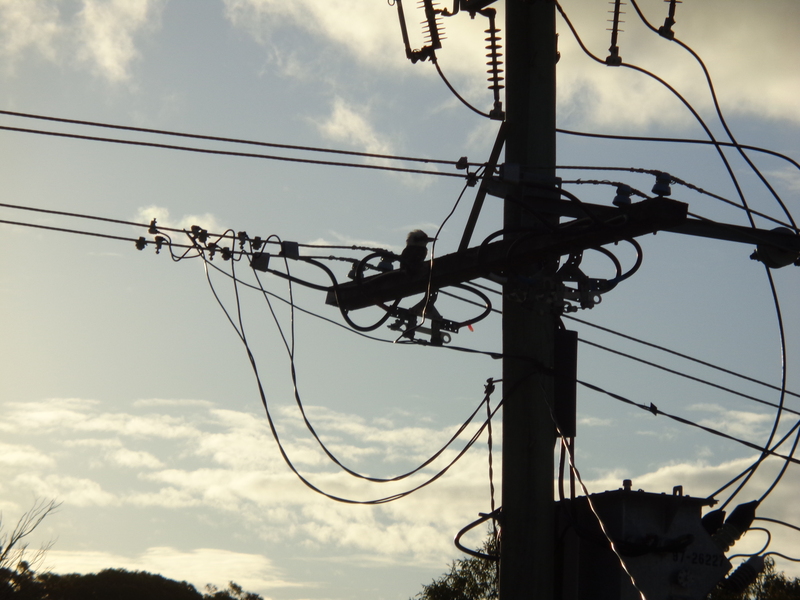 Its infrastructure isn’t as established as the USA in many ways. The majority of the population is pretty much along the coastline of Australia where the USA the population is spread out across the expanse of the country which is why I assume the US government built the interstates across the country like it has. I enjoy being the driver and eyes in our relationship but in many ways Adam can help me see things better in his own way. I often wish that he could see all the beauty that I take for granted but he seems to enjoy the ooh’s and Aah’s which escape me or me saying wow look at that! While driving on the Summerland Way in the summer, I was amazed by this one particular mountain. You could tell it was once a volcano. I was moved inside. It’s the only way I can describe this and took pictures. 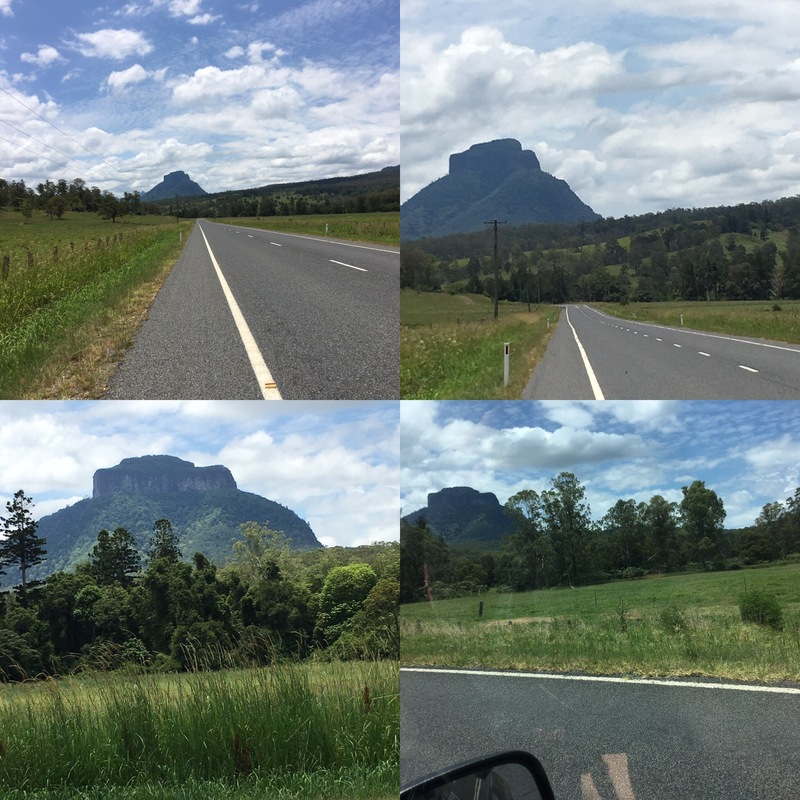 You can see how ancient and beautiful Australia is because of how the mountains are. You can be moved by the majestic panorama of the undulating mountains that have trees on them and escarpments. As we drove the winding road I noticed there had been a bushfire on a mountain but I couldn’t pull over. I continued driving and noticed how the road revealed the back of the mountain which had a sheared back with lava tubes or caves on the cliff face. It was amazing but there was no place for me to pull off to take that picture. 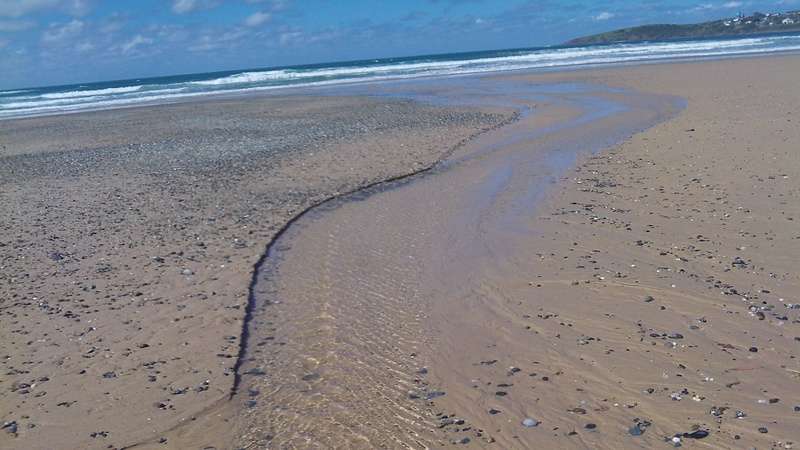 I have it in my mind though still marvelling at the beauty of it. On my first visit to Australia, I recall Adam saying that he wished he had someone who could travel with him across his native country and I thought to myself “I could be that someone” but I didn’t say a word I just thought it to myself. I now have the chance to do it and perhaps this year we might get to enjoy more road trips and exploration of his native land which I am blessed to call my home as well. There is something about Australia that calls to me. The more I learn about it the more I know I am where I am suppose to be sharing my experiences with the one I am supposed to be with. I want to share this journey and I am so glad to do so. Thank you for reading and please feel free to comment. It seems like a very long time since I have actually sat down to write down some of my thoughts. Has it been a year already? At times it feels like it has been longer and other times it feels exactly right. It seems that things don’t stand still with WordPress. It took me a little while to figure out the configuration to get to blogging but I found it. I will not be deterred. I feel like writing and sharing again. I am not even sure if anybody is interested. I am going to give it a go though and see what happens. Things with me are going along at a steady pace. 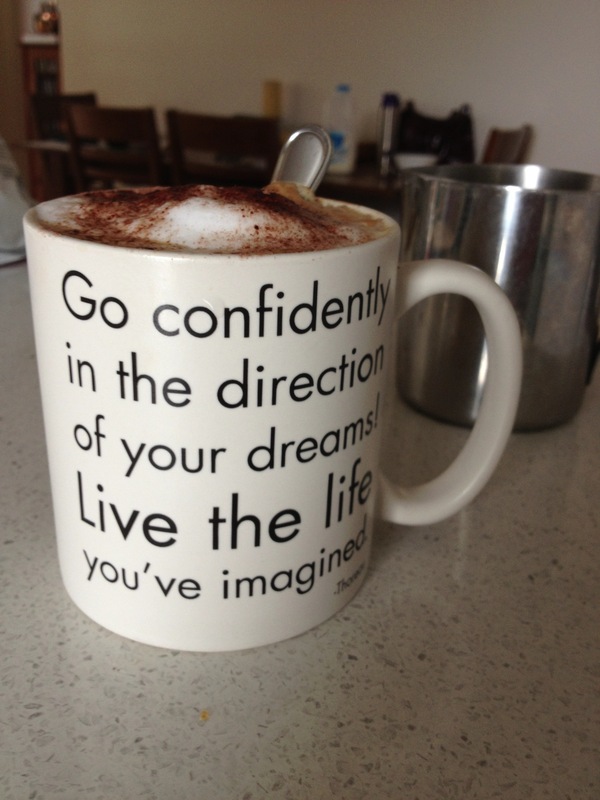 I am now studying through Charles Sturt University via the Distance Education route. I have completed 2 courses last term and in this term I am taking another 2 courses. It just started last week. Going back to school has been good for me. I had been busy getting papers written for both courses last term. I think this term it is only one big paper for Leisure, even if it isn’t I think I will do okay. I hope to maybe go up to 4 courses next term except I am nervous that I am going to muck it up. It’s kinda scary plunging back into study after so many years. The end result though will be a Bachelor Degree in Health Science (Health and Leisure). I am then going to hopefully get into a graduate program to become an Orientation and Mobility Specialist. I will also be able to work as a Diversional Therapist. It’s winter now down under. Last year didn’t seem so cold. There was actually snow inland up near the border to Queensland. I am sure most people from the northern hemisphere would just laugh at the way some people are reacting to the temperatures we’ve been getting here. It’s not like we have to run around with huge parkas. It’s a shock to the system though when you are use to running around in shorts but it hasn’t stopped some people though. I have seen them running around in thongs (flip-flops), shorts, and maybe a sloppy joe (sweatshirt). Adam and I are in our sweats mostly. We’ve also been putting on the heater at night. I am sure last year we only put it on in the morning to get the chill off the air. I didn’t mean for this lapse to happen for so long. I just got busy and self involved. I didn’t feel like sharing because I thought it was boring but hey, maybe somebody out there missed reading my thoughts. I will do my best not to be such a stranger. I can’t promise to write every day or every week. I will try to do better though. I do enjoy blogging and maybe some of you guys like reading. Any questions or comments, please let me know in the comment section! Spring is in the air down under! A couple of weeks ago this is what we saw. 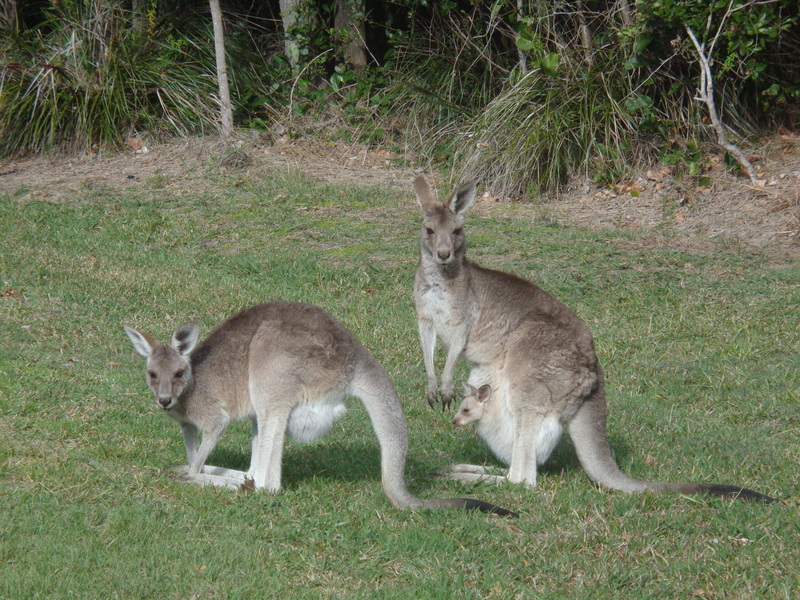 The kangaroos are really enjoying the sun and lush grass. 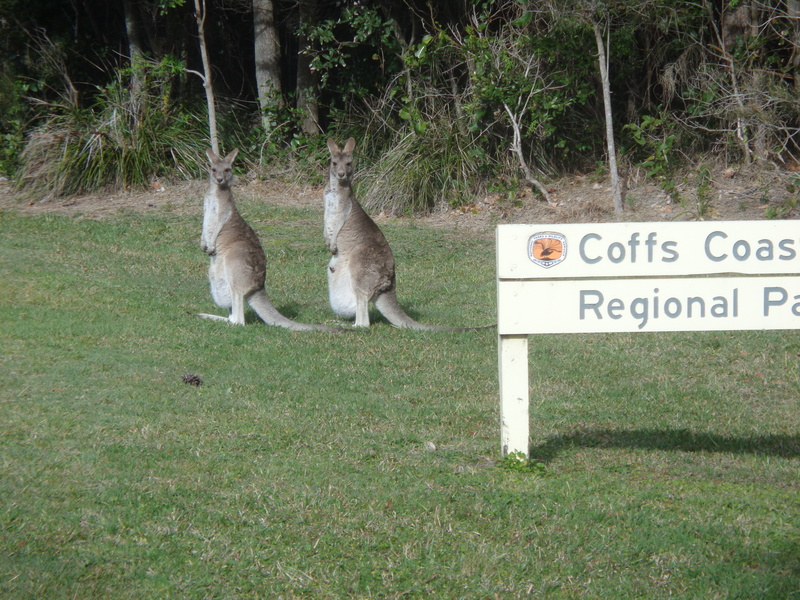 We were heading back from Cabins Beach when I saw these three while crossing Mullaway Drive. The grass looks yummy to them! Baby joey peeking out for us! I had to share this. They looked so content. 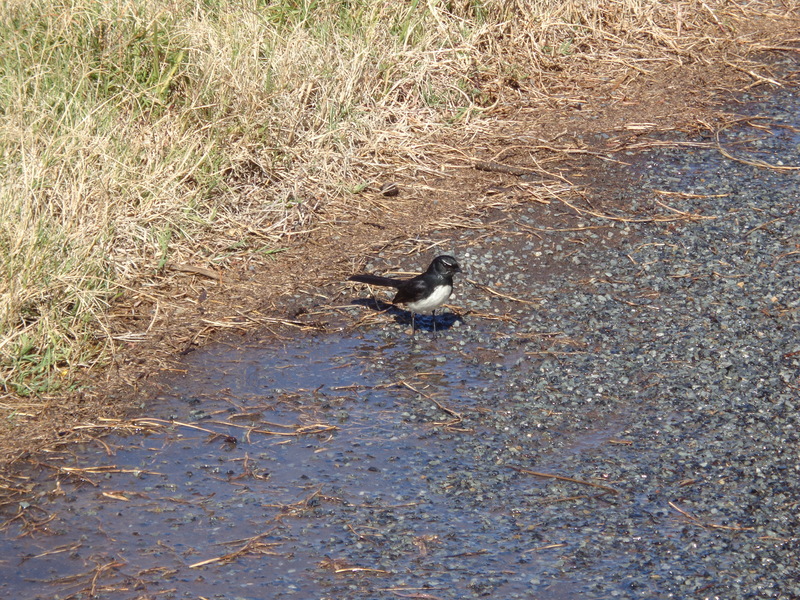 I am glad my sony has a great zoom! The roos are certainly about in Mullaway putting on a show! This title pretty much sums up the way I am starting to view the process of death. I see patterns to things. I know there are patterns to the weather as well as cycles in life. I wonder if perhaps there are cycles in the universe too. In science there is a theory about energy which is termed the conservation of energy. There is also the theory of relativity which Einstein formulated an equation that is E=MC2. There seems to be a process that everything goes through. It’s almost like a huge recycling cycle where nothing is totally destroyed instead it gets transformed into something else. 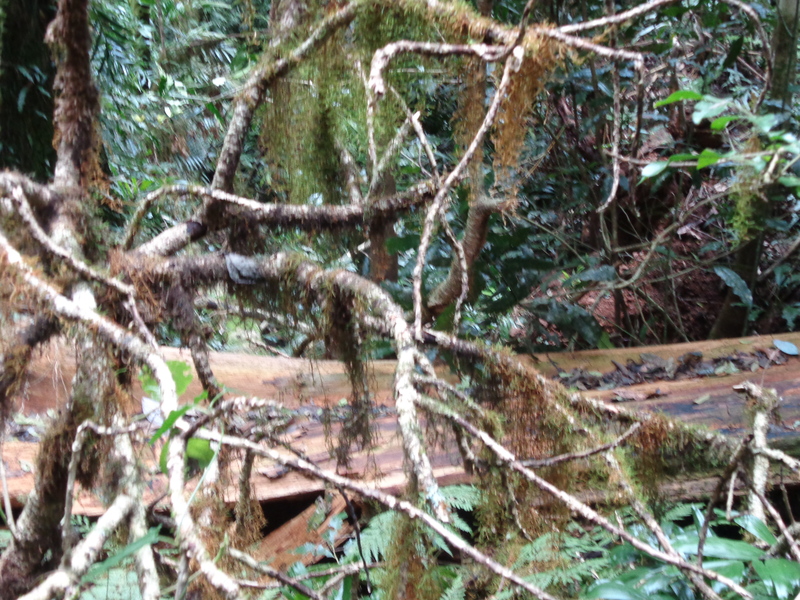 A couple of weeks ago while Adam, Lisa and I were walking at Dorrigo National Park we passed a sign which said Rotten but Not Forgotten. It stuck with me. It sort of confirmed what I had thought about in my mind. Since Lisa’s arrival with us, I have been doing a lot more exploring and discussing things with her. I don’t go mountain goat climbing with Adam on the edges of the headlands on the beaches. I had done this before with Adam on the rocks. It’s kinda of different with Adam though because he can’t see where we are heading. I am the eyes of the operation which isn’t a bad thing. It’s nice having another pair of eyes around though. I hadn’t realized how much I am enjoying having her around. 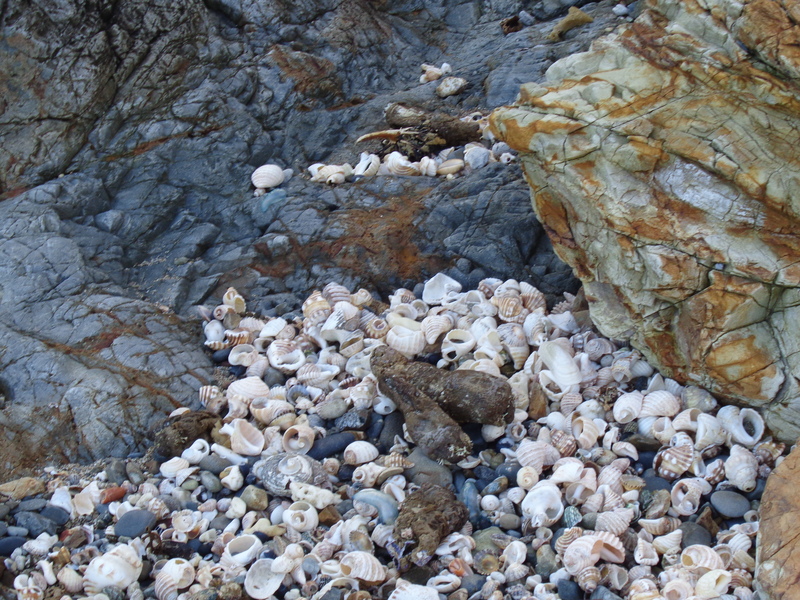 I had often thought of parts of the beach as a seashell graveyard where there are lots of broken rocks and shells being transformed into bits of sand due to the wind, sun, rain, and bombardment on rocks. Even when you walk in a forest or rainforest, you can see the process of change in the ecosystem. Everything is interdependent on something else. Although the tree may not think it is dependent on the soil it is because it has nutrients which are provided through other things such as insects and bacteria. When something dies, it is actually providing food or something relevant to its own environment. With humans though, it seems like we are independent to others yet we are still interconnected via relationships. Even though someone we know dies, they still live on with us when we remember them. We glen things from our relationships; they transform us whether we like it or not. It may seem that part of us dies when we lose someone close to us. I am starting to think maybe I am not dying but being transformed into someone else. Changes take place whether we want them or not. It’s part of life. It’s how we deal with the changes that can form us into who we are as well as the choices that we make on our journey of life that make us. We can choose to take the rotten things that happen in our lives to help or hurt those in our circles. I hope to help all I can. 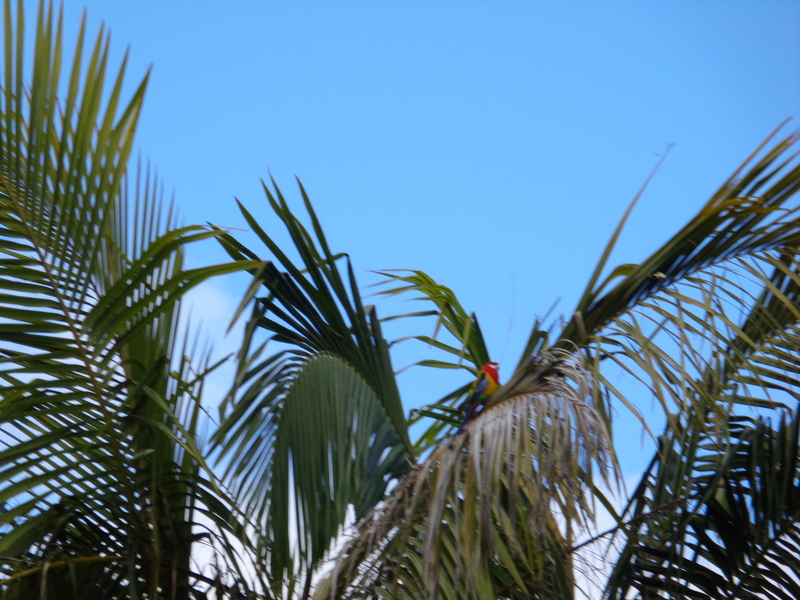 eastern rosella sitting on a palm in our neighbour’s backyard. Adam and I have been showing Lisa around the neighbourhood. 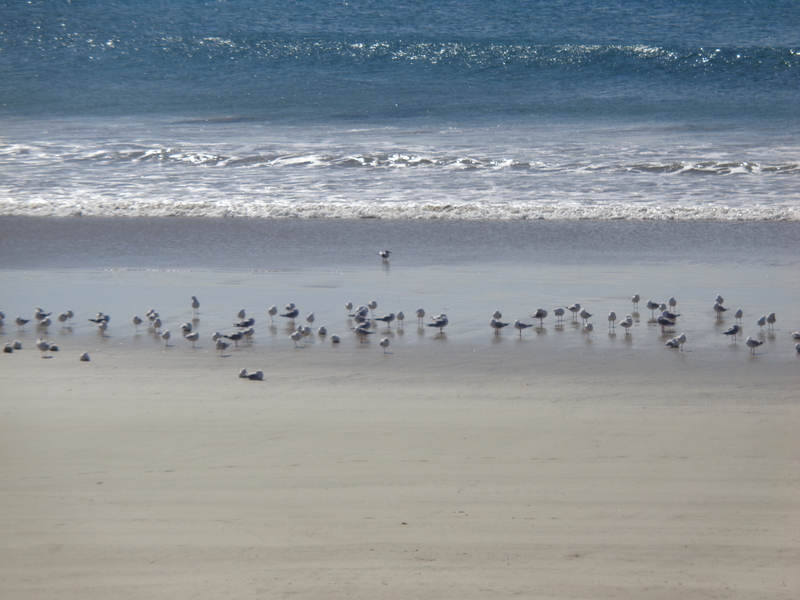 We love the birds. I know this is a short blog but I wanted to show off some of the shots I took. I know we’ll see much more as we take her around the places that we love. I must admit I do like showing off Australia so I thought I would also show you some of the birds I’ve captured with my trusty Sony camera I got from Fry’s in Burbank, California. 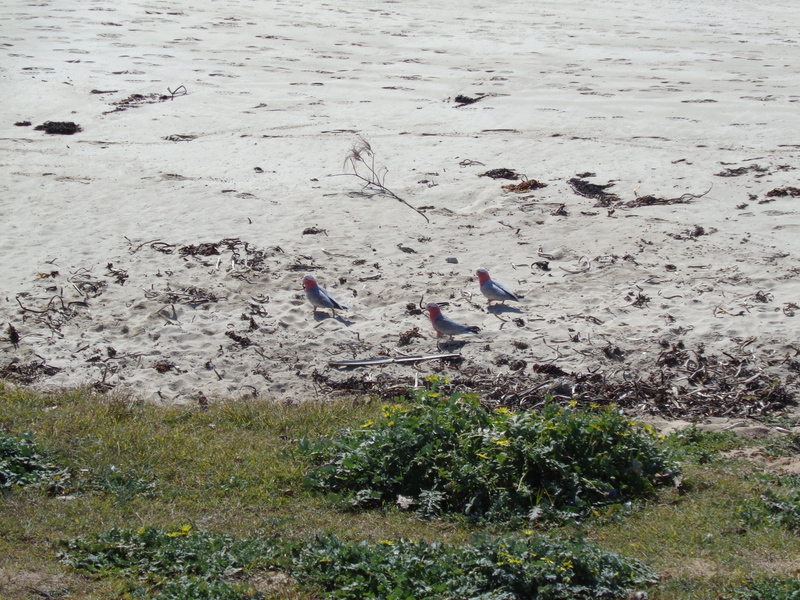 3 Galahs on Woolgoolga’s Main Beach. A Noisy Miner perched on Grevilla near our front deck. 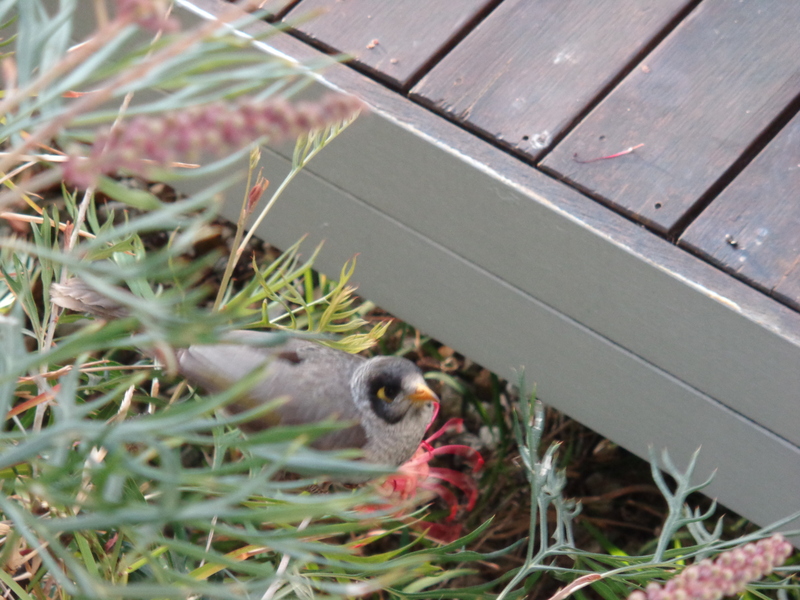 Noisy Miner enjoying our Grevilla. 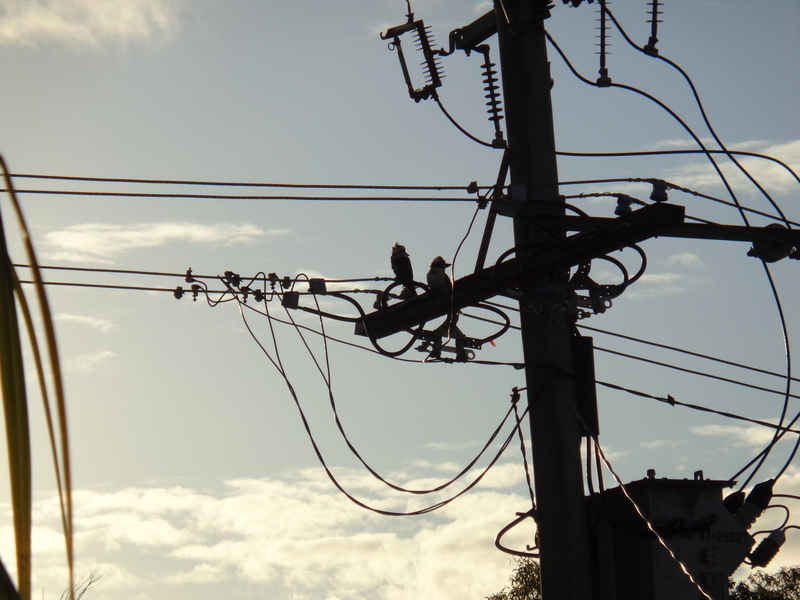 Two kookaburras on powerlines that I saw the day I took the shot of the noisy miner. 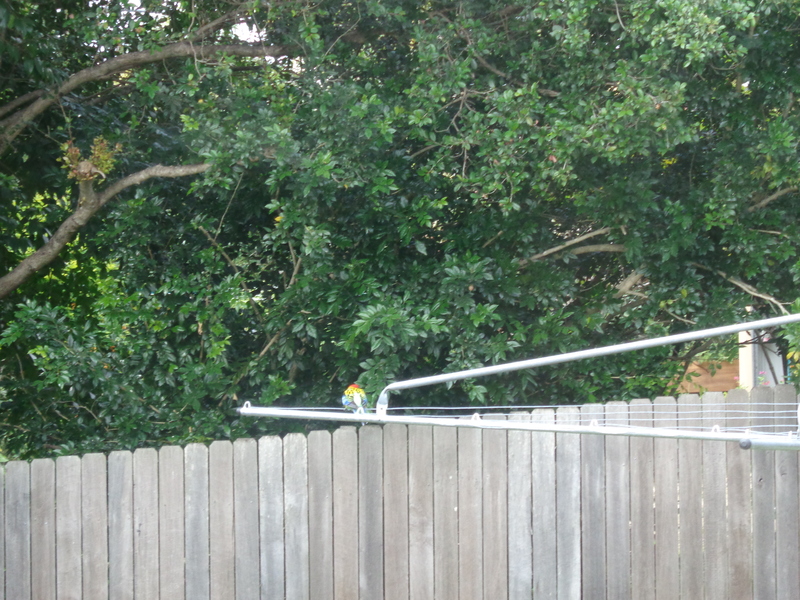 Rosella perched on our clothes line (Hills Hoist). 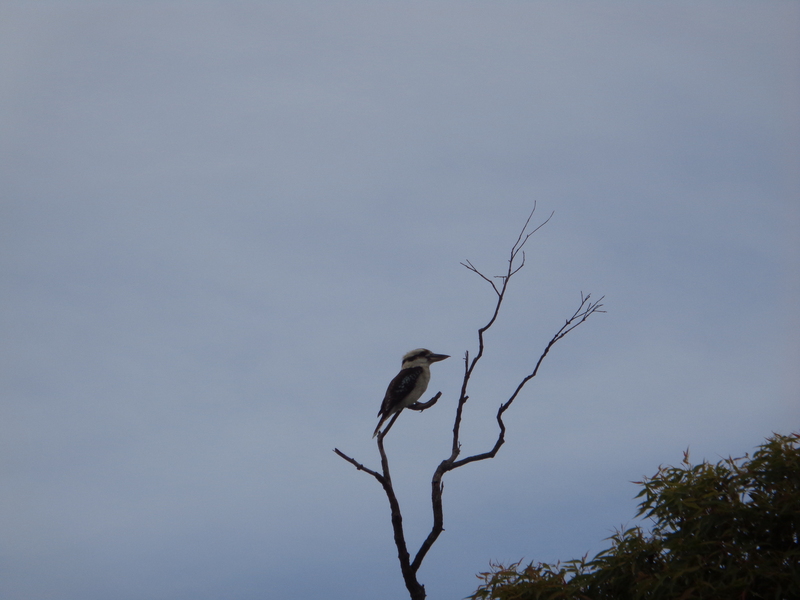 A kookaburra we saw on our walk from Mullaway Beach back home. 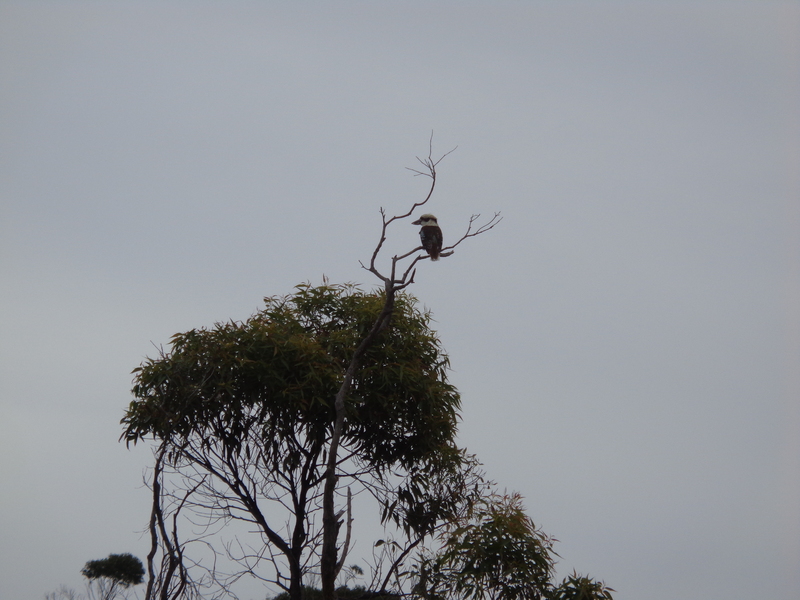 Close up of Kookaburra from walk to Mullaway Beach. 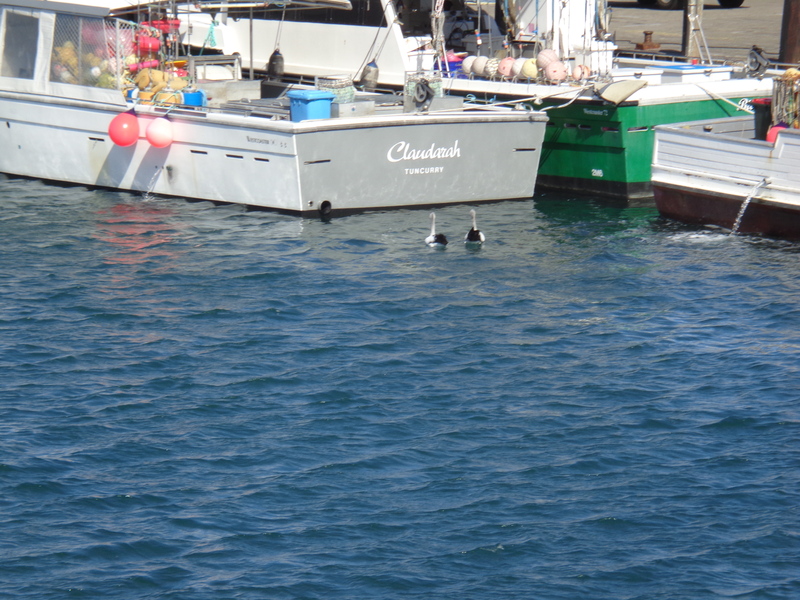 Two Pelicans at Coffs Harbour’s Harbour today. After a month and three days, Adam and I are returning to Australia. At first I thought the days were dragging. Now it seems like we were gone hardly at all. It will be nice to be at our own home. I slept for what seemed five hours. Our flight from LAX to Sydney was almost 15 hours. I am typing this blog on flight mode. It isn’t so bad either. I suspect my finger or thumb might get tired. There has been turbulence but it goes along with the dizziness I’ve been experiencing on & off because of the trunk falling on my temple. We are flying Virgin Australia. The seats are not as comfy as what we’ve had on Qantas. It isn’t a full flight either. We got thorough TSA pretty painlessly. It was really smooth considering we didn’t take our laptops with us. We checked them in our baggage. I wasn’t very happy leaving the USA but I know I will return again. It is good to know I have two countries to return to on either side of the Pacific Ocean. Sometimes you think that you don’t really influence things around you or impact others but I came to a realization the other day after reading on Facebook about the death of a former coach whom I had as a homeroom teacher when I was in Seventh grade. Coach Causey was a really awesome teacher. He inspired a lot of students. I was really shook up and still can feel the effects of knowing he’s not back in Leesville. I feel so sad for his family because if I feel this bad, I can imagine how much worse it is for them since I have lost my own parents. I have an inkling of the sense of loss that they are going through at this exact moment. The role of the teacher is quite important in my eyes. Although I don’t have qualifications as a teacher through university training I have done scripture teaching in Australia voluntarily for a few years. I have stopped for now because I am doing a sort of hiatus on that. I felt strange teaching scripture in a public classroom even though the parents have chosen for the children to attend the half hour course that our parish church provided for the area where I lived. I found it very daunting at times because when I grew up in the United States, it was a no go zone. In the first amendment of the Constitution Thomas Jefferson wrote about separation of church and state. In some ways, I totally get where he is coming from because the government doesn’t have a right to dictate to its citizens how they should or shouldn’t worship God. It’s up to the individual to do so which is another reason why I pondered the decision to continue teaching the children in public school. The government didn’t supply the scripture teachers with any funds. It was truly up to the parents to decide if they wanted the child to go to the classes. There was separation of church and state to the fullest extent but I still felt funny. When I tried explaining my feelings to some of my colleagues they just didn’t quite get what I was trying to say. I suppose it’s because you had to experience living with the concept of separation of church and state. It’s like trying to explain to a natural-born Australian why Americans think it’s their God-given right to bear arms (not all Americans do but a majority would rather die than contemplate giving up guns because they feel so strongly about this constitutional right.) You just have a mindset that feels ingrained. I know I am making a huge generalization here but if the shoe fits, by golly, I am going to wear it. For me it’s like trying to explain mateship if you have never been to an Anzac Day presentation, you just have to be there to experience the camaraderie that Australians have down to a tea. One of the things I really treasure about Australia is how relaxed they can be. They know not to take things too seriously but they also know when to be serious. I find growing up in the United States that some Americans can be very narrow minded or think they are better than others because they were born in the best country in the free world. I know I was guilty of this impression myself for the longest time until I decided to move across the Pacific Ocean to be with the man I loved. It was getting away from the USA that I actually found the scales of close- sightedness fell off of me. I feel as if I have digressed here but I am hoping to tie this all together because even my generalizations have a lasting imprint. Coach Causey had a great love for the USA. I don’t think he had ever left Vernon Parish but he really understood to the best of his ability about the sacrifice Americans have done to try and protect their country for their future generations. In his own way, he left a lasting imprint on me and I am sure on many others who were fortunate to be taught by him. He instilled pride and respect to me about the great country of my birth. My own father served his country to the best of his ability. In every life we come across, we do leave a lasting imprint. Sometimes the imprint maybe of love and happiness. Sometimes the imprint maybe of hurt and pain but I really hope that the lasting imprint I leave behind is of compassion, forgiveness, and love. In the end that is what I really want to strive for leaving a lasting imprint of love, peace, and tolerance. What would you like to leave as a lasting imprint for future generations?